Almost a month ago, Twitch premiered a Power Rangers Marathon, where all the episodes of all the Power Rangers franchise were aired back to back. For nostalgia-suckers like myself, this was certainly a treat. To watch one of the best shows that you watched growing up for free? Definitely not an opportunity to be missed. With over 45,000 viewers watching ONLY the Mighty Morphin portion (admittedly still the best over the rest), over 13 million views in total, and a whopping 60,000 viewers watching the debut of the Green Ranger alone, this can spark a new era where watching content isn’t based only on what the broadcasting station brings to you, but clearly attributed to something else. Let’s be honest, as much as the Power Ranger shows were nostalgic and entertaining, other elements such as the storyline and the graphics pales in comparison with the shows we have today. Granted, they were set in the past. But we can safely say that Power Rangers was in itself better than shows like ‘Sherlock’, ‘Breaking Bad’, and even the latest ’13 Reasons Why’? These shows have incredible storylines and in turn received incredible traction. So why is it that it was the Power Rangers got the hype that even broke Twitch? For starters, you can play the Nostalgia card, and the fact that the movie was coming up. But that means nothing for the future of television. There are only so many old shows you can air before you need new content. Woah. You’re going to stop me there all of a sudden, and call me out for mentioning something that is seemingly so small and pointless that shouldn’t be attributed to that massive success Power Rangers experienced. After all, Twitch chat has been there since Twitch started, and chatting functions were there since the times of MSN. So why this time round? This is born on a simple insight that has prevailed since generations ago: it is always better to watch a show with friends than alone. When families and friends were more closely-knitted, people would do simple things like go over to a friend’s place to watch sports, or sisters hanging out at home to watch soap operas. Fast forwarding to recent times, people actually tweeted while watching shows, such as to their friends or simply about the show to their followers. Platforms such as Twitter would track these tweets and subsequently rated the show using proprietary platforms. Twitch chat allowed you to basically talk to people who are watching the same content as you. This, of course, gave rise to all the memes from that marathon alone. But if we dig deeper, we can see how people communicate, and how we love to simply talk during a show. We can joke, give insights, or simply tell the viewers what we already know “GREEN RANGER INCOMING”, “WHITE RANGER POWER”, etc. As such, Twitch chat has become our social place where we can watch TV with people ‘next to us’. This used to apply mostly to the live-streaming content creators and their audience, where streamers will stream video games and the viewers will talk directly to the streamers or within themselves. However, this time round, the actors still do not interact with the audience. Yet, the abundance of social interaction within the viewers fuel the hype, and as the word-of-mouth spreads, more viewers tune in, and we create the chain effect from there. Am I saying Twitch is the next big thing? Definitely not, but the possibility is there. However, what we can look towards, especially for new content creators, is that community interaction is just as important, if not more. Additionally, with the state of technology that the world is currently in, it makes is so much easier to actually create the landscape for this type of interaction. 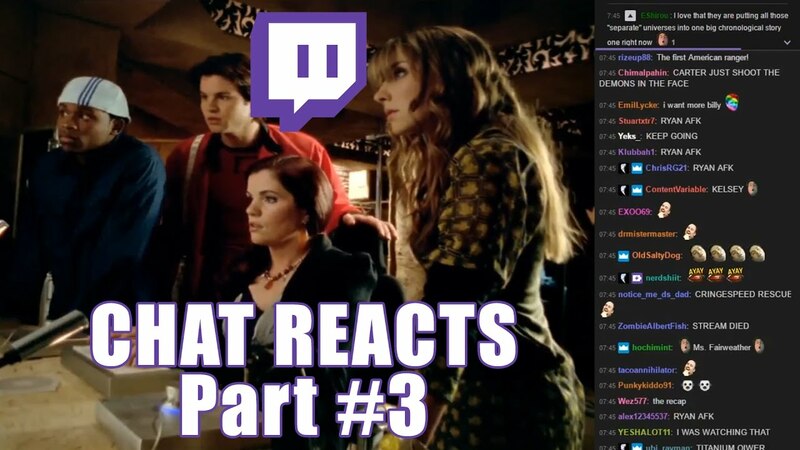 Like it or not, the function of a chat, similar to Twitch chat, can potentially fuel the new change in television, where viewers can talk to each other while watching the same show with its being aired, even though they are many miles away.